Gryphon's logo said it all. He had his own distinctive logo, was known by many names to a fan club that extended far beyond his hometown Denver neighborhood and he will always be remembered as the dog that made a difference. He was Gryphon (pronounced Griffin), The Mayor, Gritty and Grits. 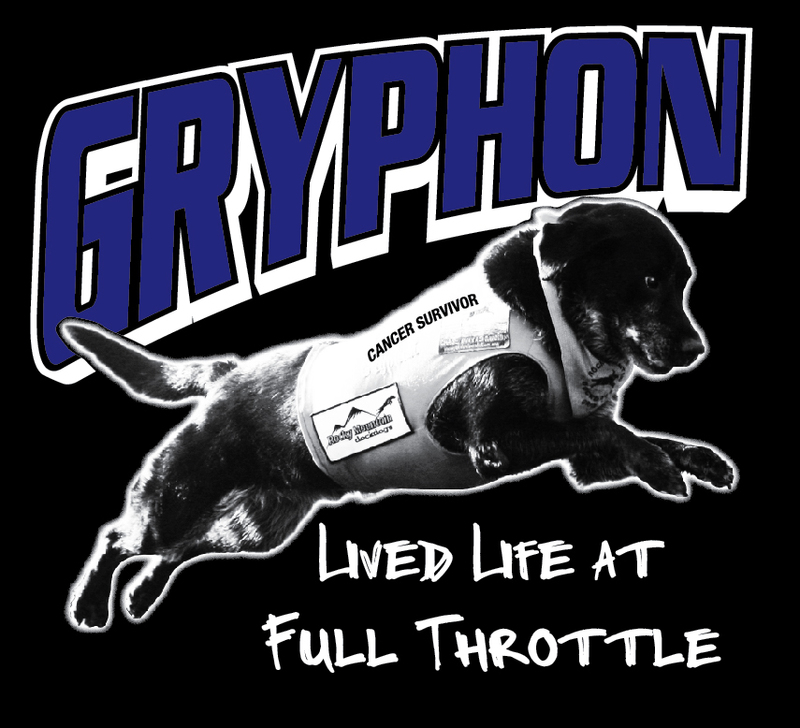 His logo: “Gryphon: Lived Life at Full Throttle” captured his charisma and verve from puppyhood to his final days in April 2010. This always-upbeat Labrador retriever, owned by Heather Raynski and John Van Soest, was an ambassador for the K-9 cancer awareness movement and a participant in the Youth and Pet Survivors, a pen-pal program that pairs children and dogs suffering from cancer. Plus, he was a highly visible figure in DockDog competition nationwide from age 11½ to 13. Gritty’s life was celebrated last month at the American College of Veterinary Internal Medicine annual convention in Denver, along with several other area pets, at a special Animal Survivors event, attended by his owners and his veterinary oncologist, Dr. Robyn Elmslie, of Englewood, Colo.
Several months after being diagnosed with a fast-growing oral plasma cell tumor, Gryphon became an official DockDog. Gritty was diagnosed with an oral plasma cell tumor (plasmacytoma) in April 2008 at age 11½ years, two weeks after a routine physical exam revealed no medical issues. The aggressive growth began quickly affecting his ability to retrieve and eat without discomfort. After an MRI lymphoma staging and a round of chemotherapy, researchers at the University of California, Davis, determined Gritty had cancer of the plasma cells. “John and I made a pact when he was diagnosed,” says Ratynski. “It would not be about us. We would let Gritty show us the way.” And he did for two more years. Owner Heather Ratynski and Gritty enjoyed an incredible relationship. "Even in the midst of extensive radiation treatment, he was always upbeat. The veterinary staff were his friends and he loved the attention," says Ratynski. Once his mouth healed from surgery, Gritty underwent 18 radiation treatments with Elmslie, five days a week over 3½ weeks. Gryphon was a “fabulous patient,” Elmslie recalls. “You have some memorable cases in your career and his ranks right up there. But much of the credit goes to Heather and John and their commitment to his quality of life. The treatments forced the tumor into remission, and within three months Gritty completed a six-mile hike in the Colorado Rockies and went on that summer to become a DockDog and pen pal for a 10-year-old girl suffering from cancer. Ratynski recalls having a “crazy idea” that Gritty could qualify for the DockDogs nationals. Wearing a “Cancer Survivor” vest and jumping five times in one day he did, becoming a huge crowd favorite in the process. He thrived on the attention. When he jumped 5 feet 11 inches, the crowd cheered. In his mind, he had soared 25 feet. “He was having fun and living life to the fullest. He thought he was a rock star,” she smiles. Gritty continued his DockDog career until he was 13. It wasn’t always fun and games between Gritty and Ratynski. “I wanted John (the dog was his birthday present) to get a rescue dog,” she says. “But we ended up going to a breeder’s home to look at some pups that would be ready to take home in a few weeks. When we discussed the litter with her, she asked if she could show us an older puppy. She brought out this 4-month-old dog that looked like a basset hound-Lab mix that she needed to find a home for. John fell in love instantly. My heart wasn’t really in it but he was a charmer and soon I was as hooked as John. Gritty wore a big smile everywhere he went. And in his mind, everyone was his friend. Gryphon gave new meaning to patience while producing plenty of laughter and inspiration, says his appreciative owner. Ironically, after beating the plasma cell tumor, two years later Gryphon succumbed to lymphoma, a form of cancer known to be treatable. “We were convinced he could beat this, too,” says Ratynski.